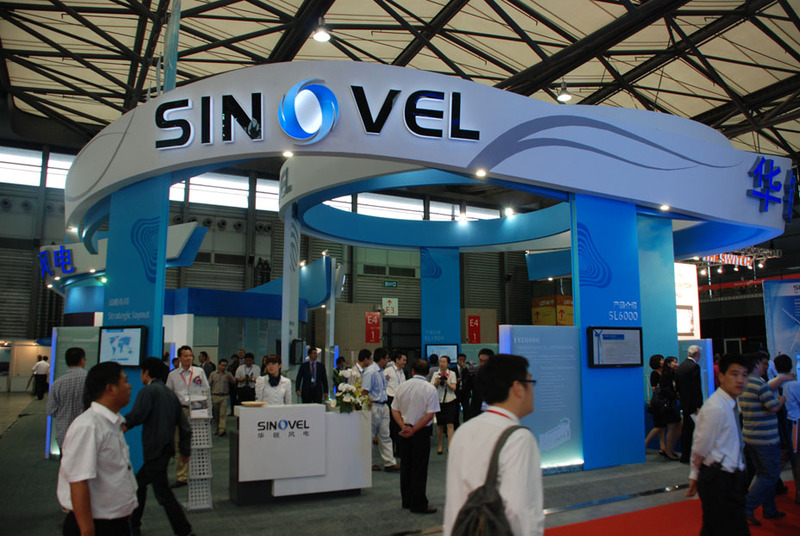 Sinovel looks into future of offshore wind power-Company News-Sinovel Wind Group Co., Ltd.
On June 15, "Offshore Wind China 2011 Conference & Exhibition" opened in Shanghai. As a cosponsor of the three-day event, Sinovel exhibited its latest offshore wind power technologies and products, including independently developed China's first 6MW wind turbine, demonstrating the current state of grid-combined operation of the offshore wind farm of Donghai Bridge in Shanghai, China's first pilot offshore wind power project. According to the source, 6MW SL6000 wind turbine, turned out by Sinovel on May 18, is China's first independently developed and a world leading grid-friendly wind turbine with full independent intellectual property right. SL6000 can be used extensively for wind farms with different wind resource conditions in various environments such as land, sea and intertidal zone. The impeller of SL6000, 128 meters in diameter, increases the sweeping area and capacity for wind collection, and boosts the effective utilization of wind resources; also, SL6000 can adjust to the extreme temperature of 45 degrees below centigrade, and has passed the test of the extreme wind speed of 62.5m/s. According to Tao Gang, senior vice president of Sinovel, SL6000 uses the technologies of parallel axes gear transmission and squirrel cage asynchronous motor to ensure high reliability and economy. Besides, the LVRT capacity of SL6000 makes it meet the rigorous requirements of grid guides of different countries, and its special anti-corrosion system satisfies high-salt-mist and high-corrosion offshore operation environment. Also, SL6000 has a system of large component self-maintenance, which can change core components such as gearbox, power generator and blade without a hoist, thus effectively reducing the maintenance cost and time of hosting and increasing the utilization rate of the turbine. Offshore wind power in the world has made great strides in 2010, up 109% from 2009. At the same time, China's offshore wind power development has entered into a stage of fast growth. Regarding the future development of the wind power industry, Tao said, "Offshore wind power will be a major growth point of the wind power industry in the future, with the further development of offshore wind power resources and the constant improvement of relevant technologies, the business of offshore wind power will become a major direction of the global wind power industry," so far, Sinovel has achieved brilliant results in several offshore and intertidal wind power model projects such as Donghai Bridge in Shanghai and Rudong, Jiangsu. In 2010, on the offshore wind farm of Donghai Bridge in Shanghai, the world's first offshore wind farm but Europe and China's first national offshore wind power model project, all the 34 3MW offshore wind turbines independently developed by Sinovel were combined to grid for power generation, and passed 240-hour pre-acceptance, thus breaking foreign monopoly in manufacturing technology of high-end wind turbines; also, the independently developed 3MW intertidal wind turbines went into operation on the intertidal wind farm in Rudong, Jiangsu, Xie Changjun, general manager of China Longyuan Power Group Corporation Limited, said, "The results of the test on the 30MW intertidal wind farm in Rudong are good, and the two 3MW intertidal wind turbines of Sinovel operated in good conditions, ranking first among the nine equipment suppliers." Besides, Sinovel won the bids for two offshore projects (600,000kW in total) in Binhai and Sheyang, Jiangsu in China's first round of bids for 1,000,000kW concessionary offshore wind power projects. In April, Sinovel and PPC, a major power company of Greece concluded a cooperative agreement on wind power generation, under which Sinovel will establish a wind farm with an installed capacity of 200MW to 300MW and an offshore wind farm in Greece, with a maximum total value of EUR 450 million. An industry insider noted that the business of offshore wind farm would play a significant role in Sinovel's future development plan.